The IBM Grid Toolbox can assist enterprises that deploy, manage, and control grid computing, as well as developers who create products that assist in managing and deploying grids. This grid-enabling toolkit contains standardized development code, much of which was harvested from the open source community, plus an added database and run-time environment. 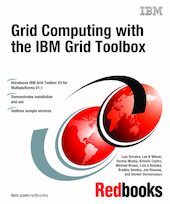 This IBM Redbooks publication is designed to give the reader a comprehensive view of the IBM Grid Toolbox. As the IBM Grid Toolbox is designed in a layered approach, we describe the product by introducing each underlying layer until the whole ecosystem is revealed. The product significantly leverages open standards in the grid computing world, so we show how the IBM Grid Toolbox complements and enhances these standards for the development and deployment of grid services and applications.